Even in their Nov 24, 2009 statement, the University of East Anglia failed to come clean about the amount of decline that was hidden. The graphic in their statement continued to “hide the decline” in the Briffa reconstruction by deleting adverse results in the last part of the 20th century. This is what Gavin Schmidt characterizes as a “good thing to do”. Here’s what UEA appears to have done in the above diagram. While they’ve used the actual Briffa reconstruction after 1960 in making their smooth, even now, they deleted values after 1960 so that the full measure of the decline of the Briffa reconstruction is hidden. Deleted values are shown in magenta. Source code is in first comment. Figure 2. Emulation of UEA Nov 2009, using all the Briffa reconstruction. # imposed by padding the series with its mean values during the first and last 25 years. But there’s a trend up at then end, you see? The last 5 data points? Hidden in plain sight. That would be in the prorot.m function? For certain values of ‘honest’ and ‘robust’. I don’t understand why the Jones 1998 and Mann 1999 series no longer break the X axis after 1980 or so as they do in the UEA press release linked to in the “Replicating the Trick Diagram” post. Could someone explain the difference between this and previous versions of the graph? it’s not what you say but what you do. The graph in which Jones’ email indicates he used “Mike’s trick” to “hide the decline” is apparently the one on the front cover of that WMO report. The text hints at how the graph could be drawn in the way it was. It seems obvious that the instrumental records were somehow grafted onto the proxy data (probably for all three lines), rather than being shown as a separate line in the graph. It surely is omitting any mention or illustration of the significant divergence between proxies and instruments in some part of the 20th century. The result is possibly misleading for anyone who isn’t aware of this divergence and the full extent of it. In such reports, swaying public opinion seems the paramount purpose; and glossing over the divergence serves that purpose. Is this a smoke screen or serious? I believe the key is for a sustained and focused call for transparency in the scientific underpinnings of AGW. Not just hiding the decline, hiding the entire record. Not trying to high jack this post, but I completed a reasonable analysis of some of the CRU data graphs and, in my opinion, they show there as been little to no significant warming. Wish I had real data instead of eyeballing PDF charts. Comments welcomed at my site. Perhaps the category should be -things that aren’t temperature. Why does Figure 2 refer to “Briffa 2000”, when UEA refers to Briffa 1999 ? Steve: There wasn’t any relevant Briffa 1999. Steve: At the main blog, this isn’t a problem. It seems difficult to find out which table, in which column, contains the un-hidden data. Which URL and column was used for the mangenta part? Is it correct to say that the instrumental data is (more) authoritative, while the tree ring data attempts to be an approximation? If so, then then the un-hidden data (magenta) does in fact illustrate that the Briffa series does not correlate with the actual temperatures (and also not with the data series from Mann and Jones) after 1960. It start diverging from the “real” temperature values even before 1960. So it seems that the deleted data really isn’t valid. Another point is that you seem to accuse UEA of still not showing the previously hidden data. But they haven’t claimed to do so, in that statement. What they did was more important: they showed the graph with the tree ring data and the instrumental data separate, which allows one to see how the combine graph came about. UEA refer to the articles which discussed why the data of Briffa, after 1960, was not included in the graph. That’s probably what they meant when they said “hidden in plain site”. So I don’t really understand why you are so harsh with UEA, except for the one point that you wanted to see the data. But now that you found it, it apparently only confirms what UEA has said about that data in the first place. It seems that except for the Briffa data after 1960 (or maybe even after 1950), the tree ring data corresponds well to the instrumental data. I am pretty sure I would have been in trouble, but if the academy is so polluted with this relative truthiness, perhaps I would have been graded higher for playing childish games, if I had the right political attitude. With the emails and data coming out all but proving what I’d always thought was the case I’ve started to do more research into all the analysis that you guys have been doing here at CA. What I’m curious is if anybody has taken the time to load the raw instrument data and run control and stability tests on them? If so do you have links to those articles/blog posts? So far I see a lot of correlation work being done between various proxies and instrument data but even on the surface the instrument data look remarkably boring (normal and in control). I’ve been tempted to download chunks of the instrument dataset into minitab myself and see what comes out. Someone please explain this one. … It flattens a period of warm temperatures in the 1940s 1930s — see those negative coefficients? Then, later on, it applies a positive multiplier so you get a nice dramatic hockey stick at the end of the century. Tell me this isn’t blatent data manipulation. So apparently it was decided, in accordance with published articles, to exclude the post-960 data, yet that data was shown in the referenced literature by Briffa. What then, if I may ask, is the problem ? The data appears to have been deleted from certain files simply because it was decided not to use that (apparently invalid) data. You don’t see any problem with deleting divergent data and splicing in something else that confirms your theory? And presenting it to the public as if it is all of one piece? 1) If the data diverges from temperature now, how do we know it didn’t in the past? 2) Wouldn’t it be a little more honest to keep separate types of data separate, even if you show them on the same plot? For example, a temperature curve, plotted as a separate line from the dendro. Then someone just looking at the pictures (as for example, those watching Al Gore’s “An Inconvenient Truth”), would have a better chance of evaluating the plots. I’ve worked in the computer graphics industry for 20 years. Rule no 1: Never delete anything. You never know when You’re going to need it. The problem is that the rest of the same-stock data is, therefore, not valid as a temperature proxy. It happens to track the instrumental data for a while, then it surely doesn’t, and that’s all we know. We have no idea what it does previous to instrumental data. I think the decline, or more precisely the divergence, raises two important issues. If we accept that tree ring data correlates with temperature, then the divergence needs to be explained. The obvious first hypothesis is that either the trees are “deniers” and are conspiring to grow more slowly and so deliberately distorting the data, or alternatively, the instumental record is inflating recent temperatures. Alternatively there may be other unknown factors which render the whole method unhelpful. Secondly, as I understand it, the instrumental record also calibrates the earlier temperatures. The divergence gap then has the effect of depressing all earlier inferred temperatures. Scott, there surely is a problem with using only part of data, and that is apparently why that has been discussed in published articles. I wish all scientific articles were available for free. The graph with separate curves for tree ring data and instrumental data seems more interesting, so I’d partially agree with you. However, the combined graph is probably a better summary. I’m sure that in preparing the graphs, many other simplifications had to be made. They appear to be the culmination of a huge amount of research, rather than just a plot of simple data points (which is what they look like). J.Peden, I think it would be difficult to make a judgement about that without being familiar with the scientific literature, specifically the articles mentioned above. Their content would have to be part of this discussion. Surely everyone agrees that the situation is far from ideal. The topic has a large amount of implicit problems, but so far I don’t see the scandal. I would hope that the culmination of a huge amount of research, would be just that: a simple plot of data points, though ones which are both accurate and precise. As my research (or lack there of) could estimate global temperature to +- 30 degrees over most time scales, I wouldn’t be making policy based on them however. The scandal for myself (a scientist) is in part, that the large amount of implicit problems are not being addressed within the normal mechanisms of scientific review. IOW, trees are good thermometers…. except when they’re not. The problem is that we no longer know how to find the raw instrument data. CRU state that they threw out a lot. Some countries have adjusted the raw data and seem reluctant to release it, if they still have it. Some agencies like CRU and GISS have at times further adjusted the “adjusted” raw data. The topic has a large amount of implicit problems, but so far I don’t see the scandal. The scandal is that these guys see nothing wrong with deliberately misleading the public by publishing a graph that purports to show how tree ring data reveals unprecedented 20th century warming — a graph which can only be created by using instrument data in place of the inconveniently “diverging” tree ring data. The fact that the truth about the tree ring data — the “divergence problem”– is discussed in the scientific literature is hardly an excuse for what Jones did. An accurate and honest treatment of the data in one venue is not a license for misrepresenting it in another. The reason a combined graph doesn’t work because they are plotting two things that may not be related to each other. In order to plot them together, you have to assume they are all real temperature anomalies. In my experience, I need a lot better correlation before I would accept that assumption. I’ll give you an example from the financial world. Lets say you follow a gold-mining stock, and note that it tends to diverge with the price of gold in the later part of the graph. We both know you wouldn’t replace the value of the stock with the price of gold (anomalies). Obviously, there are other factors that affect the price of gold mining stocks besides the value of gold; for example cash flow issues, ore deposit depletion, etc. It’s been discussed, yes, but what do you call discussion without a shred of evidence to support any of it? Wishful thinking? The fact of the matter is that dendroclimatologists simply do not know what causes divergence and therefore it is wrong to present these chronologies as authoritative, never mind attempt to cover up data that blows huge holes in the assumption that we can accurately determine past temperatures using them. It sounds like neither of you have actually read those articles. Without further knowledge, I would generally assume that such a graph represents a summary of the presented research, rather than the proof. I have some experience with graphs in other areas of research, and a graph by itself can “never” be taken as proof: it is always necessary to scientifically examine the underlying assumptions and methodology. I read elsewhere (on realclimate.org) that the IPCC report’s info for those graphs did mention that both tree ring data and instrumental data were used. At this point, your disagreement with the graph is a scientific disagreement with the underlying research, and would need to be discussed scientifically. If I add those artificial corrections to northern hemisphere tree-ring data, we get this, which is what appeared for tree rings on the WHO report. It appears, therefore, that those artificial corrections were applied to the tree-ring data before some kind of smoothing and averaging to obtain the graph. Can that be true? That would be too brazen, wouldn’t it? Perhaps these corrections just a side-show as a way of determining the size of the divergence? Isn’t Mann 1999 the original “Hockey Stick” that was produced with inappropriate data (bristlecone pine rings) and code that generated a hockey stick even when fed Red Noise? If so, how can they possibly use this? Maybe I’m missing something obvious. Something that people are missing, is that to make the splice (even the overlay) of instrumental data valid, you have to assume a precise matchup of proxy and instrumental at some point. It seems they did this by eye to make the graph look best. There is no documentation I have seen that this was done in some justified manner. Do you accept the premise that the tree ring data as presented is directly equivalent to temperature anomalies? If so, that is where we disagree. Yes. If they had chosen a different point to “splice” the datasets, they would have had a very different graph. If prior to 1960 closer to where the divergence began, they would have had a graph that no one would have taken seriously. If much later, they don’t have the hockey stick. The Hadley/CRU generated claim for global warming can no longer be supported after the emails and their destruction of the base data, however many of us “sceptics” are not sure how critical their analysis was to the whole IPCC global warming argument. It would help all of us if you could comment on this, I haven’t seen any other blog that addresses this specifically. Hey, where’s the instrumented data line? This must be McIntyre’s Trick, don’t rub it in? Scott, just a quick reply before I get home: Personally, I take tree ring data as an indication rather than as proof. The graph also shows that the three data series differ even amongst each other. However, climate research has been dealing with this question for a very long time. The recent update to the IPCC report acknowledges that there is less than 100% scientific certainty by saying that waiting for scientific certainty could mean that we miss crucial tipping points without even knowing it. (Of course the latter statement isn’t just related to the use of tree ring data). After digging out a true gem of an email from the CRU stash, in which Michael Mann stated in no uncertain terms that the temperature plots from the GRIP and Dye 3 icecores showed “significant differences” for the MWP (despite the relevant graphs in reality being virtually identical), I’ve had to come to the conclusion that his and UEA’s little clique are so thoroughly self-deluded on the whole subject of the millenial temperature record that they just can’t help themselves any longer. They’ll do whatever it takes to keep on believing their “20th century is the hottest ever” mantra, and have the rest of the world believe it too, no matter how unscientific or generally dodgy that course of action might need to be. Hacking off a few decades of data from a series here or there so as to make a graph look more convincing would have to seem trivial, to anyone of that mindset. njcons has just told me CRU have just “deleted” – removed 8 months of their CRUT3 monthly anomalies for 2009. Unannounced that I have seen. I checked at about 6am Canberra time on 30 Nov.
HadCRUT3 is the same, 8 months edited out – as is HadSST2 – so the issue is through land and sea data. However, nobody has told the Hadley Centre…..
No – sorry. Comment on the site indicated the data was still available on the MetOffice site. Speculating that it is the “Emergency Server” issue at the CRU. The gridded anomalies thru October are still available here. I wish I knew more science and I curse my lazy teenage high school brain for my current state of ignorance. I’ve been plodding through this stuff for over a week now and am only just beginning to get past the acronyms and the terms you all use with such ease. One thing I do know is people and the emails told me enough about the made-men of climate science to start digging. People confident in their expertise do not hide their light, or their data/code, so to speak, under a bushel. They willingly share it, almost to the point of obnoxiousness, as a shining beacon for others to follow. In that spirit I thank you and others for shedding some light for me on what is a difficult subject. I am, indeed, learning. Suppose all of current temperature trends are down to natural forces. Would you consider natural warming to represent “a problem” now, or possibly some time in the future? I have had difficulty running the code in R.
Is there some library I should have loaded? From my very inexperienced look, is “CRU” a header in the Briffa table? The only header that looks like that is “CRU99”. Does that mean the data has changed since you prepared the code? I’m sorry – this will be the least of your concerns, but since you’ve gone to the effort of posting the code, I wanted to ask. Steve: I’m sorry for the buggy code that I posted. I’ve obviously got slightly tweaked things in my console. I didn’t shut down my computer and run from scratch. I should have. At some point, I’ll shut down my computer and re-run without things in my console. DaveJR: Not sure about the ice melting we already have, I see it more as a future problem. Does it answer your question? Will mine be answered as well? Is there some consensus here around this blog, is Steve’s position on this question known? J.Peden, I think it would be difficult to make a judgement about that [use of Briffa’s tree ring data as Global average temp. proxies] without being familiar with the scientific literature, specifically the articles mentioned above. No, it’s cut and dried just the way it is: Briffa’s tree rings simply cannot be used as temperature proxies to reconstruct pre-instrumental Global temperature averages – because they haven’t even been able to do it in the relatively short span of instrumental records, unless maybe the instrumental temps. are wrong and they should have been following the tree rings downward when the divergence occured, which is actually a real possibility the way things have been looking now for some years in regard to the methods of Climate “science”. Note that the scientists who are presumeably familiar with the literature have no solution to the “divergence” problem themselves, other than to try to hide it. Not exactly. If climate change was entirely natural, how far would you want to go to prevent it, as opposed to adapt to it? How warm is too warm depends, IMO, on a) how much is man-made compared to natural (what changes need to be made to produce x degC change in temperature? ), and b) how far we’re prepared to go to artificially alter climate if natural forces are the most dominant. My personal opinion is that the effects of CO2 have been vastly overstated compared to other factors (a sum of natural and other man-made sources) because it’s politically convenient just to focus on CO2 and it’s politically convenient for some scientists to maximise this view. Therefore, it is unclear to me whether massive efforts to reduce CO2 would a) have any discernable effect while b) impacting on the quality of life, and potentially technological advancement, of everyone. I much prefer the thorough approach by Pielke Sr and can sympathise with his exasperation at the IPCC for taking such a politically convenient view of climate change. Only by identifying the various effects can we best determine what policy or combination of policies to take. I’m afraid I don’t subscribe to the idea that making huge efforts to reduce CO2 (beyond increasing efficiency) is a good thing regardles of whether the predictions of CO2 on climate are right or wrong ie I don’t believe the ends can only justify the means. This is a view opposed by at least one of the Climategate correspondents. Norbert, Steve is not renowned for speculating about what might happen re future temperatures. He also discourages general global warming discussions – please try to stick to the specific topic. Splicing the two graphs together is misleading, as the two things are quite different, and it should never be done. Even Mann agrees with that. Glad my last URL-laden post didn’t make it through moderation. I’ve now done a much better piece, “Hiding the Decline” (click), for newcomers as well as regulars; it takes cognizance of Steve’s work here, and zooms in to enlarge the crucial splice details of the two UEA charts, their origins and their differences. Please tell me if I’ve got any of it wrong. I’ve worked hard to get it out as I think clear visuals are important to show enough people EXACTLY what “hide the decline” is about, and how strange stuff is still continuing, but my science may not be perfect. Is it possible that I am only one who is finding it difficult to navigate this mirror site? In fact, I have to admit to being lost, which is unfortunate and more than a bit frustrating at this exciting time. OK, I admit to being a dummy when it comes to understanding the structure of sites, but I thought that CA had been quite easy to cope with. Is there a primer on site navigation readily available? Steve: This was thrown up quickly because CA crashed. Stop complaining. What is the significance of a modern proxy study? Why wouldn’t you just look at the instrumentation? Very nice work Lucy and you are right – crisp, clear, correct graphics are crucial in explaining the issues. Re Lucy Skywalker (above): You asked for feedback in case you got any of it wrong. (By the way, I like your site and applaud your efforts–thank you!) You mention about the two black lines (summer and winter temperatures) plotted separately, and that the two crisscross (which is crazy). Actually, it is the temperature ANOMALIES that are being plotted, not the actual temperatures (note y-axis label), so there is, prima facie, nothing crazy about the two black lines crisscrossing. Thanks again for a great visual. Re my posting of yesterday. I wasn’t complaining – far from it, I love what’s going on here – but I was getting lost. I understand why, now that you explain that the mirror is a quick solution to a difficult technical problem. How wrong is this graph considered to be, how far away from what it should be? And more importantly: how far away would a corrected graph be from showing global warming? Would have to remove tree data completely? And what would it be like then? Or is this thread, and this site, only about finding errors? BTW, as I said above, I personally also prefer a graph with separates lines, but I find the combined graph acceptable as a simplification for a summary. Certainly I wouldn’t consider it a scandal. For a graph which allows a more critical examination of the underlying data, there are many other available graphs, for example by Mann, which also show more data series than just these three. In the context of the thread’s graph, ending in 2000, smoothed and referenced to the 1960’s, remember that 1998 was the largest spike in the global instrument record. It was caused by an El Nino and totally natural. Is there any way of adding the modern (to 2009) portion of either your reconstructions, or simply the land/sat records to show where the graph goes after 2000? Justified manner… If 1998 was not a GHG/man made phenomenon then you would be justified in removing it as a choice as to where to splice the temperature record to the reconstruction. I would love to read your thoughts about THAT choice. Thanks a lot for the code. As there are a few bugs in it and the debugging can be quite time consuming I want to share my edited R-file (all data files are included, sorry for the messy plot part – I’m an absolute R-beginner). Shallow Climate, thanks for that correction. Actually, far from resolving anything it deepens the mystery. I’ve altered my text accordingly. Also put in a shot from the UEA page. Folks, in all this focusing on the search for correlations per se, don’t forget basic theory: CO2 absorbs IR, and so must be a warming stimulus. Sure, we can argue over how much effect, what other things complicate it, but that’s that. As for the misconduct: first, it was a clique and not all AGW supporters all over, and second: you’ve heard of prosecutors/police “framing a guilty man”? They worry if they can get a conviction, so they “improve” the evidence. That doesn’t make the man innocent. Note, it isn’t likely old Svante Arrhenius was being sneaky way back in 1896. Steve: I do not want people to debate the “big picture” in one paragraph bites. Every thread then looks the same. Re Lucy Skywalker (just above): You respond to me with more grace than I had true humility in responding to you. I find the points you raise (at your linked site) to be fascinating, and I appreciate your thoroughness and devotion. Again, thanks for what it is, IMO, a great site. I am a geologist, so I naturally have a different view than most. 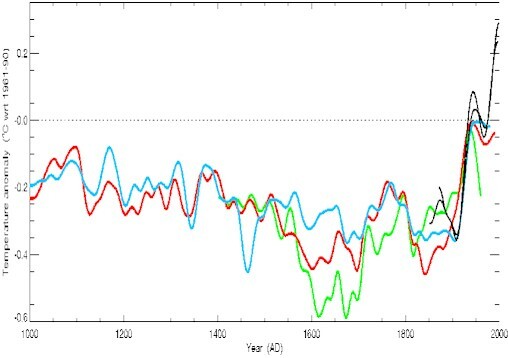 The Earth has seen much warmer periods than the present, and much colder. Sea levels have been much higher than the present, and much lower. Species have come and gone, with no concern to how they felt about it. The Earth has had no problem surviving these changes, and I’m sure that man can adapt to any climate shifts that occur. With reference to what kind of graphs and changes would convince me; I don’t know. I do know I have no confidence in much of what I’ve seen, and I could write a book on why. Suffice it to say that tree rings, varves, and every other type of proxy data we have, seem to depend on factors other than temperature. Can someone convince me that a certain dendro line (whether from ring width, wood density, isotopic fractionation measures, etc) correlates to temperature? Of course. However, I haven’t seen one yet, though I could be convinced if I saw the methodology behind the data and I trusted the sources. Another problem is that even our instrument temperature data is questionable, and it doesn’t help that the slopes of regression lines are reported to the hundredth of a degree, when the original data is probably +/- a degree. As a skeptic, I am willing to look at all points of view. However, after all my experience viewing hundreds of lines of evidence, I don’t see anything unusual in today’s climate. We are much closer to the coldest period in Earth’s history than the warmest, even if you only include the Phanerozoic. We are barely out of glaciation, after all! I would agree, merging the thermometer temperatures on the same graphwith the proxies is not the correct thing to do. Actually, it is =- snip – in this case to do so. As the thermometer temps diverge severely from the proxies post 1960, there obviously is something unaccounted for in the temperature data. The three proxies tend to agree with each other, it is the thermometer data that is the odd man out. Best to look for reasons why the thermometer data may be out of whack. (heat islands or changes in way temperatures were taken as time progessed or ??) Since there is something quite amiss between the proxies and the thermometers post 1960, to replace proxy data with thermometer data is closer to =snip – than good science. Scott, which time scales are you referring to? Very long ones, like Ice Age and Dinosaur age? Steve: I closed down my R-session and will re-run the script and tidy. My abject apologies for not doing so before. Both long and short, geologically speaking. The geologic record shows quite clearly that something cooled the Earth during the Pleistocene, causing the ice ages. Prior to that, we didn’t see these repeated large scale continental glaciations. In fact, Greenland is still covered with ice, and there is evidence it had less ice just 700 (?) years ago, which may or may not indicate cooling since then. Geologists generally regard the current time as an interglacial, and the sense is that we will see another glaciation soon (geologically speaking), assuming the trends continue. As for the Mesozoic (dinosaur age), rocks state quite clearly that sea levels were generally much higher than currently, and it is likely that we had no or little icecaps at the poles for much of this time. Given that, it is probable that temperatures were almost always warmer than currently. @Hugo M: I think this should be just “briffa=gate” (gate from line 11). I think I managed to get all bugs out. Steve: I re-ran with a fresh console and fixed the two small bugs in the online script noted above. Scripts is now clean. The edits are not relevant to the output (as I’d dealt with them on the console) but I try to make these turnkey and apologize for not checking it on a fresh console before placing it online. Too hasty. Scott, I didn’t have the impression that the question is whether planet earth would survive. The question is whether we would want any drastic changes. But this leads off-topic. Perhaps there is some other thread where we can discuss this? snip – editorially there is no purpose in one paragraph discussion of the big picture without working off an article. Hold this debate for now. Norbert (please excuse me for jumping in, Scott) – I’m also a geologist and a skeptic. As for your queries concerning whether we would want drastic changes, this is irrelevant. The earth has always been (and will continue to be, at least until the Sun eats it) in a state of flux. Our planet has run the gamut from molten planetoid (according to currently accepted theory) to frozen ice cube (I hear the Wooly Mammoths loved it). What you’re asking is about human preference — and that’s the crux of the climate change argument. Geo-engineering aside (as I think it’s a horrible idea), human beings are certainly not in the driver’s seat regarding the planet’s thermostat. If you truly wish to know more about the particulars of the debate, may I humbly suggest searching Bishop Hill’s Blog (http://bishophill.squarespace.com/). As others have stated, ClimateAudit is concerned with the statistical analysis (and validity) of climatological studies. Yes we are off topic, and thanks to Steve for allowing that. I’ll just answer your last question, because I have to run. As I said, I am a geologist although I have worked with tree ring geochemistry, so my area of expertise is in geology not meteorology. The point I’m trying to make is, that regardless of whether the global temperature is going up or down at this moment, we are much closer to another ice age than to catasrophic warming. I don’t believe the data we have proves or disproves global warming. I don’t know whether it is warming now or not. Also, from comparing your code with Michael’s (above), it looks like yours is plotting only one out of four time series: only one “plot( c(time(smoothb))…” line. Again, I’m sure this is the least of your worries, but I assume you wouldn’t have bothered to post it if you didn’t want it to be entirely reproducible. AJ Strat provides a CRU map showing the range of variation in measurement. It is significant that the widest variation is seen in Northern high latitudes where claimed global warming has been most significant. It is all in the >4 degree C category. Delete if too vanilla/plebeian. My Weather/Climate memory has retreating Ice at Poles a result of not only temp. but Drought, which can be caused by declining GMT. Less energy at Equator to evaporate water, weaker winds to distribute said vapor, less water transported to Poles to fall as precip, to then augment ice after seasonal melt, etc. What memory fails is the relationship and scale, GMT/precip/and related trends. Anyone? I’m calling cooling, but my degree is old. … and how is that “reliability” assessed? By comparing to temperatures, right? Seeking an interview with you Mr. McIntyre!!?? I am a producer/host on KPFK 90.7fm in Los Angeles and have always questioned the science behind human induced global warming. Please email me at your earliest convenience!! And thank you so much for all that you do! Playing hide and seek behind the trees « Watts Up With That?